Xamarin.Forms’ TableView is a really useful control for displaying static content. However, it has some shortfalls. The one we will look at today is customizing the Section Title. Before reading ahead, I would suggest looking at your solution and assessing whether or not your TableView could be easily replaced by a ListView. I want to point this out, because ListViews have more flexibility for GroupHeader and allow you to put any control in there without having to leave your happy place that is XAML. If that isn’t the case, keep reading; Let’s look at some simple custom renderers that can solve this problem for Android specifically. Similar to the iOS solution, the important part is our override of GetView. What we are doing here is getting a reference to the inner child native views of our section header (why we check against the type and TextCell). Then we get our actual android TextView and the LinearLayout which is the divider below the header. From there we can change the properties of the views however we prefer. The default behavior of these views are to take the AccentColor from the android styles and use them as the BackgroundColor of the divider and the TextColor of the TextView. Who knew it could be so difficult to just put a number on a circle in Xamarin.Forms? Here’s a freebie to make your life easier in creating your own badges. Before we dive in, I want to note that with the Xamarin.Forms.Themes, this can be easier. Check out the docs here: https://developer.xamarin.com/guides/xamarin-forms/user-interface/themes/. Basically, they added a StyleClass for BoxView that allows you to render it as a circle (although I’ve had problems with it in the past). This example is going to be avoiding the Themes package with a custom rolled implementation. To start, we are going to create a custom CircleView. That CircleView is going to inherit from BoxView and use a custom renderer to give us the rounded edges we want. After that, we are going to make a reusable view called BadgeView that will essentially just slap a Label on top of our new CircleView. Now let’s create our custom renderers. I want to note, that for iOS it is much simpler, and could also be done as an Effect rather than a BoxRenderer, however, in order to be consistent with the more complicated Android implementation, we are doing both as renderers. Now let’s apply that to a reusable BadgeView. This is obviously a super simple example, but you can always add any other properties you want such as handling changing sizes, corners, shapes, colors, etc. 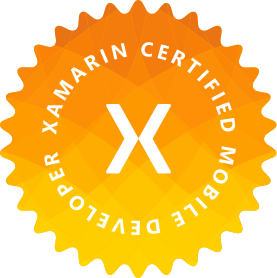 However, we are not always using Xamarin.Forms, so let’s take a look at achieving the same functionality with just Xamarin.iOS. The next step is to take our processed html string and turn it into something that an iOS UILabel can use.